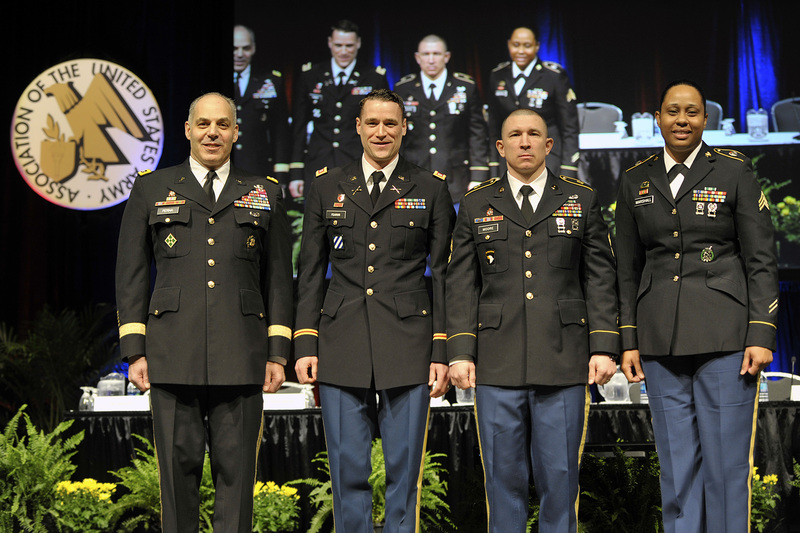 Three soldiers, selected as the 2017 Army athletes and coach of the year, were honored at the Association of the U.S. Army’s Global Force Symposium and Exposition in Huntsville, Ala.
Sgt. 1st Class David L. Moore, a squadron maintenance management noncommissioned officer, with the Regimental Engineer Squadron, 2nd Cavalry Regiment, Grafenwoehr, Germany, and a member of the All-Army Softball Team, was honored as the 2017 Male Army Athlete of the Year. Sgt. Latoya N. Marshall, Wilmington Recruiting Company, Raleigh, N.C., and a member of the All-Army Volleyball Team, was recognized as the 2017 Female Army Athlete of the year. Capt. Jeffrey J. Fearing, company tactical officer, United States Military Academy Corps of Cadets, West Point, N.Y., and the coach of the All-Army Hockey Team, was named the 2017 Army Coach of the Year. The awards were presented at the symposium by Gen. Gustave Perna, commanding general, U.S. Army Materiel Command. Moore, who has served in the Army for 19 years, deployed during the initial surge into Iraq in 2003-2004. He has played Army softball for five years and has won four gold medals and one silver medal. He was also selected to be a member of the Armed Forces Team three years in a row, and was the team captain in 2017. He had an impressive batting average of .667 with six home runs, 24 RBIs and a .941 fielding percentage during 2017 Armed Forces Softball Tournament. Moore is also a softball ambassador. He was selected to the winning All Star Team in the Almere Netherlands Softball Tournament, where he had a .742 batting average, seven home runs and 15 RBIs. He also led the Europe Slow Pitch Softball League Tournament team to victory with a .721 batting average, five home runs and 18 RBIs. Off the field, he volunteered 96 hours during the Annual German/American Volksfest which strengthened the relationship between American soldiers and German citizens. He also volunteered to assist with coaching a youth soccer team. The citation read: “His display of professionalism and sportsmanship is one that should be emulated by others. Marshall has played on the All-Army Volleyball Team for five years. She has been selected every year to the Armed Forces Volleyball Team, and has won gold medals for the Army during Armed Forces tournaments. She has a national gold medal from USA Volleyball, and a gold medal from her island while playing for the American Samoa National Volleyball Team. She attended the University of Nevada on an athletic scholarship playing volleyball and basketball for the Wolfpack. During her college years she received numerous accolades and honors, and recently she was inducted into University of Nevada Sports Hall of Fame. While stationed in Korea, she devoted her time to a local orphanage where she read books to children, supervised arts and crafts and learned the Korea culture. She was the U.S. Army Garrison Humphreys Female Athlete of the Quarter in 2017, a member of the Osan Holiday Basketball Classic Women’s All-Tournament Team, the 2017 Korea-Wide Peninsula Basketball Champions and the 2017 Guam March Madness Invitational Championship. In the United States she volunteers at a local high school athletic program by performing individual workouts, scouting other teams and being involved in the professional development of the high school student athletes. The citation read: “As a top Army recruiter, she has demonstrated exceptional leadership skills teaching soldiers and students life lessons through sports. Fearing graduated from West Point in 2008 as a field artillery officer who deployed to Afghanistan as a member of Task Force Brawler from December 2012 to September 2013. In July 2017, he was selected as the head coach of the first ever All-Army Hockey Team, an initiative of the Army chief of staff, Gen. Mark Milley. Fearing was directly involved in standing up the team, from determining the necessary equipment needed, to selecting the personnel to attend a three week training camp at Fort Drum, N.Y. He planned, led, and played – as a player-coach – in the three-week training camp. The team came together quickly and throughout the training camp competed in games against the West Point Club Hockey team, winning 6 to 4, and twice against the Watertown Wolves professional hockey team, winning both games 8 to 6 and 9 to 7. The All-Army Hockey Team then competed in a game against the Royal Canadian Armed Forces Flyers, before a sold-out Watertown Municipal Arena, and won 4 to 2. The team then represented the United States Armed Forces at the 5th Annual Baltic Winter Games in Vilnius, Lithuania, and won the tournament by defeating Estonia 9 to 0, Latvia 6 to 4, and Lithuania 2 to 1 – winning the gold medal for the United States. Fearing also led the USA team in goals to include scoring a hat trick and the eventual game-winning goal against Latvia in the semi-finals. He also set up as many community engagements as the team’s busy schedule allowed, and the team conducted over twelve total volunteer hours of on-ice instruction to local youth teams in northern New York.